Folens, one of Ireland’s leading educational publishers, is celebrating 60 years in business, during which it has entertained and educated children with their much-loved Annuals. Even today, interest and excitement has not diminished thanks to their engaging and current content. Christmas 2018 marks the seventh year of the Folens Christmas Annual Charity Campaign. The campaign, which has proved incredibly successful over the years, involves thousands of Christmas Annuals being donated to children’s wards across the country. Entitled ‘Súgradh, Sonas, Siamsa and Spraoi’, the Folens Christmas Annual evokes memories of childhood. Christmas stockings hanging over the fireplace packed with treats, family fun and always a Christmas Annual from Folens to provide a day full of entertainment. Elizabeth Ivory, Marketing Manager at Folens, said; “Now in its seventh year, the Folens Christmas Annual Charity Campaign reminds us of the challenges faced by children receiving care as well as their families. Every year our Christmas Annuals help to lift spirits and add a little festive cheer. The Folens Christmas Annual Charity Campaign would not be possible without the support of the dedicated volunteers of Children’s Hospital Ireland (CHI), who help to distribute the annuals throughout children’s wards nationwide. CHI is a voluntary organisation working directly with children in hospitals to help them cope with illness and hospitalisation through the provision of daily play sessions and provides ongoing support to families. This October Bank Holiday weekend saw an outstanding 27,300 pass through the doors of the RDS Simmonscourt to visit the 250 exhibitors at the Autumn permanent tsb Ideal Home Show. An overall satisfaction rate of 99% was recognised amongst both visitors and exhibitors alike. The 250 exhibitors showcased a wide range of products and services across the Bank Holiday weekend, including bespoke furniture, innovative products and interiors. The scale of the sales success spanned across all sectors, from high tech home automation systems to beautiful bespoke creations and interiors. Windows, doors, soft furnishings and home décor were in high demand, as were insulations, energy systems and home security. Sean D. Lemass, CEO of SDL Exhibitions Ltd commented: “This weekend’s Autumn 2018 permanent tsb Ideal Home Show confirmed beyond doubt that The Celtic Tiger is back. Not only was this the largest edition of the event since 2007 completely filling all of the 10,500 Sq. Metres of exhibition space in the RDS Simmonscourt Pavilion, but it attracted over 27,000 home owners who were investing in the properties, comfort and lifestyle at a rate that has not been seen at any event in Ireland for over a decade. SuperValu celebrity ambassadors cooked up a storm for the visitors across the 4 day event at the Chefs LIVE Theatre, with recipes such as Bressie’s pomegranate chicken wings and Kevin Dundon’s winter warmers proving to be firm crowd favourites. Kirstie McDermott of House & Home Magazine hosted a number of talks on the House & Home Interiors and Design Theatre across the weekend, including a chat with television’s Quantity Surveyor Patricia Power and Niamh Donnelly of permanent tsb who provided their top tips on how first time buyers can approach the first steps of the property ladder. Roisin Murphy, designer of the Cúl Art House also spoke to Kirstie about how to eliminate clutter in the home and make your bedroom the perfect place for a better nights’ sleep. The Colourtrend Interior Design Forum was extremely popular amongst visitors, the 7 room sets created by some of Ireland’s best interior designers were decorated with bespoke pieces provided visitors with ideas and inspiration for their own home décor projects. Rebecca Roe of HedgeRoe Designs was announced as the winner of the project, by designing a living room inspired by a hint of exotic. Throughout her room set she used a tarnished gold paint by Colourtrend called ‘Tobacco Plant’ which complimented HedgeRoe’s hand-block printed wall panels. Second place was awarded to Rachel Hobbs Design, who created al fresco inspired outdoor retreat. The show’s title sponsor permanent tsb had their team on hand to help with financial needs including mortgages, home insurance, current accounts, personal loans and much more. The permanent tsb Ideal Home Show returns to the RDS in Spring 2019. Log on to www.idealhome.ie for further information. Members of the public in Drogheda are being invited to attend an important information briefing on arrangements for Fleadh Cheoil na hÉireann 2018. The event, which is hosted by the local Fleadh Executive Committee and supported by Louth County Council, will be held on Thursday 21st June between 4pm and 7:30pm at the Drogheda Youth Development building on Narrow Street West. A panel of representatives will lead the briefing from the Fleadh Executive Committee, Louth County Council, An Garda Síochána and Safe Events. The briefing will allow members of the public to review plans for the Fleadh Cheoil na hÉireann and address any issues they may have with regard to traffic disruption, road closures and transport links during the week- long event. Fleadh Cheoil na hÉireann is the largest celebration of Irish music, song and dance in the world and this year’s event marks the first time that the festival will be held on the north east coast of the country. Fleadh Drogheda, which is supported by main sponsor the Credit Union, will be held from 12th – 19th of August and boasts some of the country’s most talented musicians, singers and dancers including Martin Hayes and Denis Cahill, Zoë Conway, Damien Dempsey, Pádraigín Ni Uallacháin, Sibéal Davitt and Gerry O’Connor. For further information on the special briefing session on Wednesday 30th May, please contact info@fleadhcheoil.ie . Fleadh Cheoil na hÉireann 2018 is delighted to announce the launch of this year’s Fleadh Volunteer programme, which will run throughout the 8 day festival from 12th – 19th August 2018. The programme, which is coordinated by the Louth Volunteer Centre and backed by Coca-Cola International Services, invites applications from anyone interested in getting involved in the world’s largest celebration of Irish traditional music and culture. 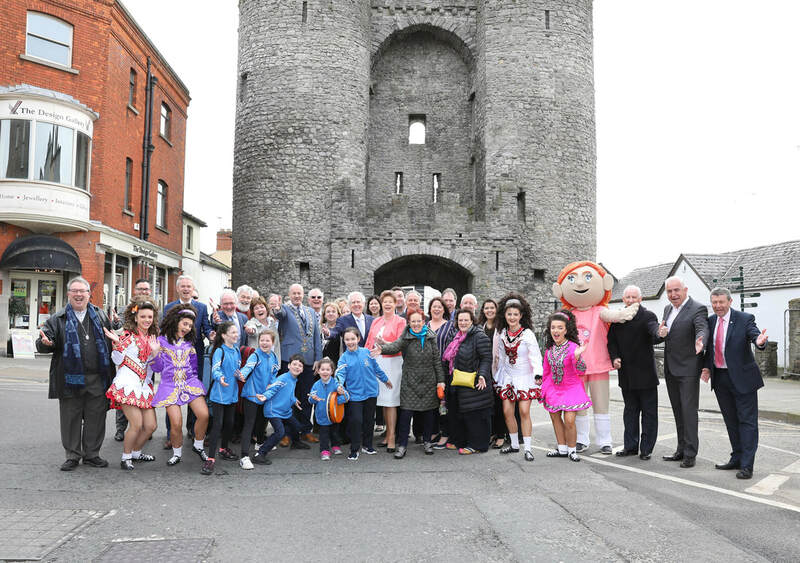 Over 1,000 volunteers will be required to help stage this year’s Fleadh and ensure that Drogheda offers a memorable and enjoyable experience for the 400,000 visitors expected to descend on the area this August. Volunteers will play a pivotal role in not only the success of the Fleadh but in showing off Drogheda and the whole North East region in its best light. By joining the Fleadh Volunteer Programme, participants can look forward to becoming part of a family of volunteers, have fun and meet new people, whilst also showcasing the very best that this year’s festival has to offer. Commenting on the Volunteer Programme, Gráinne Berrill, Manager of the Louth Volunteer Centre said; “We are very excited to announce the launch of the Fleadh Cheoil na hÉireann Volunteer Programme 2018. Volunteering has a profoundly positive impact on people and their local communities. It is timely that we should announce the Fleadh Volunteer Programme during National Volunteering Week, with the theme of Building Better Communities. It is our aim that through the Fleadh Volunteer Programme, and with the backing of Coca-Cola International Services who are passionate about making a positive difference in our local communities, that the people of County Louth and the surrounding region come together as a community to build a world class event which showcases the region as a must-visit destination. Last year applications were received from as far as away as Russia and already this year applications have come in from volunteers in Italy and the UK. This year’s programme offers a wide range of roles to suit all ages abilities and interests. Applications are now open to people aged 15 years and older – there is no upper limit! Volunteer shifts vary in length from 4 – 8 hours and all volunteers must attend mandatory training, which is scheduled for July and August, in advance of Fleadh Cheoil na hÉireann. To register your interest in becoming a volunteer, visit http://fleadhcheoil.ie/volunteers/or contact the Louth Volunteer Centre team at 041 9809008. 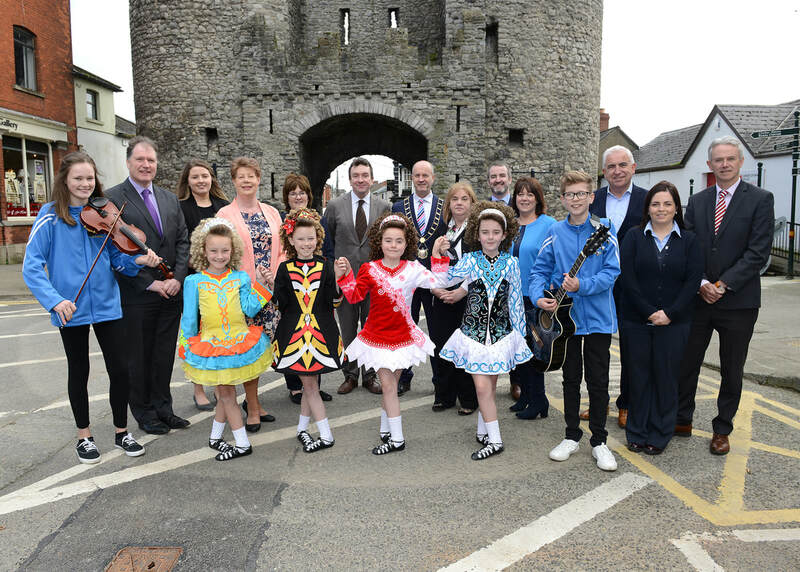 Fleadh Cheoil na hÉireann 2018 is the largest celebration of Irish music, song and dance in the world and has been launched in Drogheda, Co.Louth today, Tuesday 1st May 2018. This year’s Fleadh, which is sponsored by the Credit Union, will be held from 12th – 19th of August and boasts some of the country’s most talented musicians, singers and dancers including Martin Hayes and Denis Cahill, Zoë Conway, Damien Dempsey, Pádraigín Ni Uallacháin, Sibéal Davitt and Gerry O’Connor. Today’s launch marks the first time Fleadh Cheoil na hÉireann will be held on the north east coast of the country and organisers have worked tirelessly to ensure that this year’s event will offer a unique and memorable experience for the whole family to enjoy. Visitors can look forward to seeing Stockton’s Wing reform for a one-off performance for the first time in decades, whilst Irish traditional band Beoga who were recently announced as the support act for Ed Sheeran’s greatly-anticipated Irish shows, are sure to draw large crowds into Drogheda this August. Aoife Ruane, Chair of the Programme Committee said: "We have taken great pleasure and pride in exploring and preparing the concert programme for this year’s Fleadh Cheoil na hÉireann; reflecting the immense wealth of talent, experience, and ingenuity in traditional Irish music today, and in particular highlighting the work of artists in the Oriel Region. Drogheda is situated at the southern end of the ancient kingdom of Oriel, stretching northwards across borders and boundaries to Armagh. It is one of the richest areas of traditional music in Ireland and has a wealth of music collected in manuscript and transmitted orally down through generations." Fleadh Cheoil na hÉireann 2018 offers Drogheda and the surrounding region a unique opportunity to showcase itself on both a national and international stage. With over 400,000 people expected to visit the region for the week-long festival, 30% of which are expected to travel from overseas, organisers are committed to promoting Drogheda and County Louth as a world-class tourist destination. The Chief Executive of Louth County Council, Joan Martin commented:“Hosting Fleadh Cheoil na hÉireann for two consecutive years is an honour for County Louth and the town of Drogheda. It also offers signiciant economic benefits for the area, with an estimated €40million expected to flow into County Louth as a result of the festival. This year’s line-up has been described as one of the most exciting to date, with an array of artists of local, national and international significance including the Hot House Flowers, Julie Fowlis, Frankie Gavin, Odhrán Ó Casaide, Mairead and Triona Ni Dhomhnall, Andy Irvine and Donal Lunny, Moya Brennan & Cormac De Barra, Ulaid, The Voice Squad and Sibeal O Casaide. Completing the line-up are Kieran Hanrahan, this year’s recipient of the third The Flanagan Brothers, Michael Holohan, Mick O’Brien & Family, banjo player Stevie Dunne, the RTÉ Contempo Quartlet and the RTÉ Concert Orchestra in a programme that also celebrates Irish traditional music song and dance and its importance through families and the intergenerational exchange that takes place. Drogheda is a town built on community spirit. It is a vibrant town driven by a positive outlook, nestling in a tranquil oasis of heritage and culture. Its enthusiasm and can-do attitude has never been more evident than when it was announced that the Fleadh would be coming to Ireland’s biggest town this August. The many community and voluntary groups of Louth were not found wanting when asked to help with the mammoth task of organising the biggest celebration of Irish culture in the world. In addition to the army of volunteers, who are instrumental in the planning and staging of Fleadh Cheoil na hÉireann, the local community are also being encouraged to get involved in this years festivities. With hundreds of thousands of people expected to attend this summer’s event, residents in Drogheda and the surrounding region are being urged to rent out their homes or spare rooms to people searching for accommdation. People are also invited to take part in various other activities surrounding the Fleadh, including the incredibly popular Scoil Éigse, which offers people of all ages the opportunity to participate in workshops and traditional music sessions to gain a deeper understanding and appreciation of Irish music. It is estimated that approximately 900 musicians will attend Scoil Éigse workshops in Drogheda this August. This year’s Fleadh offers an extensive youth programme which aims to increase student’s awareness of Irish culture and tradition and encourage them to become actively involved in the celebrations for Fleadh Cheoil na hÉireann. 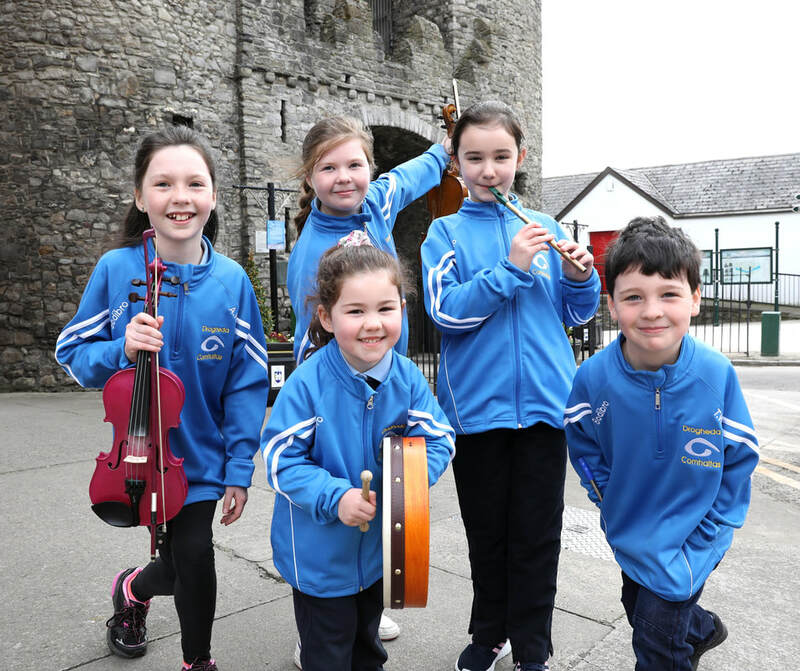 The school children of Drogheda and the surrounding region are leading the charge when it comes to participation and initiative, by taking part in musical events and arts and crafts programmes with their local communities. The Chairperson of the Fleadh Executive Committee, Lolo Robinson said:“I am delighted at the level of interest shown by the community who have come forward in large numbers expressing an interest in getting involved in Fleadh Cheoil na hÉireann. Speaking on behaf of the collective group of Credit Unions across the North East sponsoring Fleadh Cheoil na hÉireann, Tom Kiely, CEO, Drogheda Credit Union commented:“It is very exciting that a group of Credit Unions across the North East have come together to be Main Sponsor for the Fleadh Cheoil na hEireann 2018. Drogheda Credit Union and Dundalk Credit Union have teamed up with Credit Unions across Louth, Meath & North Dublin to support our communities for this massive event, tying in with our not-for-profit ethos and role at the very heart of our communities. Whether attending for one day or the entire week, Drogheda and County Louth as a whole offer a wealth of attractions and the warmest of welcomes to visitors this August. 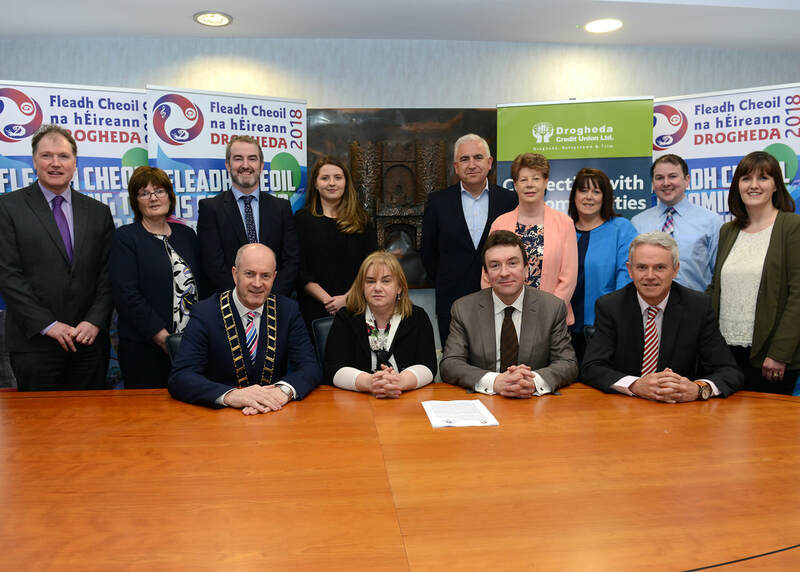 Drogheda Credit Union and Dundalk Credit Union have joined forces with a group of Credit Unions across Louth, Meath and North Dublin to fund the sponsorship of the Fleadh Cheoil na hEireann 2018. “ The Credit Union” has been announced as the main sponsor of Fleadh Cheoil na hÉireann which will take place this summer in Drogheda from 12th – 19th August. Both Drogheda and Dundalk Credit Unions celebrate their 50th anniversaries this year and have been strong supporters of Fleadh Drogheda from the outset, forming a collaborative group of Credit Unions that also includes Ardee Credit Union, Duleek Credit Union, Dunleer Credit Union and Progressive Credit Union from North Dublin to support and sponsor the biggest family festival in the country. Sponsoring the massive community event that is Fleadh Cheoil na hÉireann ties in with the Credit Unions’ not-for-profit ethos and role at the very heart of communities all over Ireland. “The Credit Union” consistently aims to make our communities a better place by supporting community enhancing events and initiatives and identified Fleadh Drogheda as a unique opportunity to become part of a much wider initiative showcasing Drogheda and County Louth as a place of beauty, culture and a go to tourist destination. This is the first time in many years that the Fleadh will be held on the east coast of Ireland and the local economy is set to benefit to the tune of €40million. 400,000 visitors are expected to attend the week-long festival in August, with 30% of people expected to travel from overseas to enjoy the festivities on offer. Today’s sponsorship announcement comes ahead of next week’s official launch of Fleadh Cheoil na hÉireann, when a full program of events will be announced. Last weekend saw the permanent tsb Ideal Home Show welcome 26,816 people into the RDS Simmonscourt across the three day event, resulting in an outstanding 98% visitor satisfaction rate. With over 220 exhibitors showcasing their bespoke pieces, innovative products and interiors, the visitors were spoilt for choice across the weekend. Exhibitors reported strong sales during the weekend with a 97% satsfaction rate. Up to €100 Million worth of revenue is expected to be generated by exhibitors from their participation at this year’s spring show. The scale of the sales success spanned across all sectors, from high tech home automation systems to beautifully hand crafted creations for all aspects of the home. DublinBeds.ie reported non-stop sales over the weekend whilst Matt Britton Carpets were inundated with enquiries for their beautiful range of floor coverings. Windows, doors, soft furnishings and décor were in high demand, as were insulations, energy systems and home security. A range of familiar faces participated in the show, with Linda Barker of BBC’s Changing Rooms discussing her top tips on the Irish Times Home & Design Theatreas well as RTE’s Patricia Power and Declan O’Donnell who made a welcomed return to the show to answer building queries at the Irish Times Home & Design Theatre. Irish rugby players Tadhg Furlong, Jack McGrath and Sean Cronin were also in attendance over the weekend as they met fans at the AVIVA Smarthome on Sunday. The Colourtrend Interior Design Forum was extremely popular amongst visitors, as it served as a place to garner inspiration for their own homes, with 7 creatively executed bespoke room sets on display by 7 wonderfully talented interior designers. This year’s spring show has been a resounding success, with exhibitors reporting increased sales across the board. The permanent tsb Ideal Home Show returns to the RDS in autumn 2018. Log on to www.idealhome.ie for further information. -0.5% on March 2017, Insurance Costs in March 2018 -13.8% lower than March 2017. Average motor insurance costs in March 2018 +37% higher than March 2013. The Society of the Irish Motor Industry (SIMI) today issued the SIMI Quarterly Motor Industry Review Q1 2018. The Report shows that in the first quarter of 2018 new diesel registrations accounted for 56.3% of the market a decline from 66.7% on quarter one last year while petrol accounted for 37.5% of the total up from 29.6% on Q1 of 2017. Average CO2 emissions for new cars sold were 1.4% higher in the first quarter of 2018 when compared to a year earlier. The recent move away from diesel to petrol has resulted in average CO2 emissions now trending upwards again after a prolonged period of desirable decline. The SIMI Report highlights a number of price decreases in the cost of motoring. The average price of a new car in Q1 2018 was 1.9% lower than a year earlier; interestingly consumers are spending more on higher specification cars with the average OMSP (Open Market Sales Price) up 4.1% on Q1 last year. The cost of Motor Insurance in March 2018 was 13.8% lower than it was a year earlier; however average Motor Insurance costs in March were 37% higher than in March 2013. While the cost of fuel decreased slightly in Q1 of 2018 with Petrol prices down 0.7% and Diesel prices down 0.5% last year. For 2018 new car registrations are forecasted to reach around 120,000 which would represent a decline of 8.6% on 2017 while used car imports by contrast are projected to grow by around 15% to reach 107,470. Similar to last year Brexit related uncertainty looks set to continue, largely due to the uncertain performance of sterling and the impact of used imports from the UK. Alan Nolan, Director General of SIMI further commented: “The further fall in new car sales this year really couldn’t have come at a worse time from an environmental viewpoint, just as we are beginning to benefit from a wider range of Electric and Hybrid cars, at the very start of our transition to 2045 when it is projected that the entire fleet should be Zero emitting. The fall in Irish used car values due to the huge increase in imported used car volumes, as a knock-on from the weakening of Sterling resulting from Brexit, has made the cost to trade-up more expensive and has slowed-down our new car sales. Secondary school students in Drogheda are being invited to take centre stage as part of the celebrations in the run up to Fleadh Cheoil na hÉireann 2018. The Youth Committee for Fleadh Cheoil na hÉireann as part of its ongoing Secondary Schools Project is inviting students to put their stamp on a major creative initiative. In collaboration with The Men’s Shed in Drogheda, The Youth Committee is teaming up with local businesses to create small wooden sculptures of traditional Irish musical instruments. Youth Committee Chairperson Orla Brannigan is calling on schools to get involved by painting and decorating the sculptures, which will be displayed throughout the town during the week of the Fleadh from 12th – 19th August 2018. The sculptures will be ready in the coming weeks, then the work on decoration can begin. Those interested in taking part are asked to contact orla.brannigan@ucdconnect.ie.